Principally, we have evolved to communicate nonverbally - through physical expressions. Surprisingly, very amazing and unimaginably ancient system inside our brain understands and also conveys emotions or intentions through physical expressions only. It’s called as the Limbic System. It works very precisely and we can survive because of same. Here’s an interesting story about how the limbic system evolved. In fact, it’s a short story of our own evolution - how a water dwelling creatures turned into land roaming creatures and further into a walking, speaking and hunting race which we all belong to i. e. Homo Sapiens. Hard to believe for many of us is that most of the extinguished and existing creatures evolved from common ancestors. They existed in water past 360 million years. Climatic changes and/or struggle to survive forced them migrating to land. Their fins transformed into limbs/legs to roam and outer skin became tougher to endure dry and harsh climate on land. They developed lungs to breathe. Amphibians, reptiles, birds and mammals are descendants of same land roaming ancestors. Reptiles evolved 320 to 310 million years ago. This was the true beginning of limbic system development. They evolved a reflexive system to fight, flight, feed and breed. Reptilian behavioral patterns are very apparent and predictable but those helped them to survive in the environment they roamed. There were no emotions in world of creatures till mammals appeared on earth. Mammals evolved during collapse of dinosaur dynasty. Surprisingly, they evolved from reptiles 220 million years ago. Mammals emerged with more deliberate, social and motivated behavior unlike seemingly cold, impassive and brutal reptiles. The reason behind it would be linked to their altered metabolism, reproduction, nurturing, bonding and habitation. Mammals grow offspring inside their bodies till certain stage of development, feed them by secretion from mammary glands and control body temperature to adjust diverse climatic conditions. New mammalian brain structure Cortex was built upon reptilian complex. Even though mammals become more superior in survival strategies, they naturally incline to reptilian flight or fight approach. They developed variations to compensate fight or flight approach by more dramatic, planned and coordinated movements, behavior and physical expressions. Emotions were incredible gift along with strong sense of different smells and ability to remember them (Olfactory system). It helped them to endure different situations and circumstances. They flourished and spread on entire planet. Finally appeared the common ancestors (Hominoidea) of humans and apes (orangutans, gorillas, chimpanzees and bonobos) - the primate ancestors who evolved 65 million years ago. They might have evolved from mammals who skilled in climbing on trees for food and shelter. Primates evolved more complex parts inside brains for adopting new living environments, anatomical features and social challenges. They developed superior system to coordinate movements and maneuvers on trees and ground. They gained ability to think and plan. Their vision become more advanced so stronger became visual memory. They could remember and recall scenes voluntarily. Why apes did not further evolve as human though we share more than 98% genetic profile with them? This question definitely comes into our curious mind. 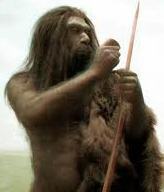 As like today, groups of common ancestors (who further evolved as modern apes) were living in thick forest areas that was far away from homeland of some members. Chain of climatic disruptions during 3 to 5 millions of years ago separated those few from forest inhabiting groups forever. Hugh drop in rainfall on north-eastern part of African continent (Afar valley, Ethiopia) replaced forests full of tall - large - lush trees by vast planes of grass and bushes. Apparently, nature forced our ancestors to roam on ground. They started walking on their two legs (hind limbs) with two hands free (fore limbs) to gather food, make tools, hunt animals, catch fishes and farm crops. They started living in fixed shelters. Ability to walk on two feet (bipedal anatomy) changed our apparent behavior, movement patterns and ultimately the way of communication. Making different facial expressions, gestures and sounds became beneficial to express emotions and feelings among members in group. Throughout different civilizations, we kept improving and diversifying our life style, occupation and communication. We formed ethics and cultural - social norms. We (modern humans) are called as Homo Sapiens that literally means as "wise man" or "knowing man" in Latin. Neocortex is the most advanced structure that rests above reptile and mammalian brain. It gives us ability of reasoning, imagination, speaking languages, introspection, navigation, mathematical calculations and problem solving. We can harbor feelings, regulate emotions and restrain limbic impulses but cannot entirely surpass them. Moreover, visual and emotional memory makes us to act or behave the way our ancestors would have done in remote history. We become comfortable in favorable environments and situations and uncomfortable in distress and (signs of) danger. Under threat, we experience more or less same kind of physiological responses like reptiles or mammals give (flight or fight/run away). On the other hand, we display rage or aggression exactly like other animals do (fight). Only we can bring variation in basic defense patterns that are instinctively exercised by other creatures. If we pay keen and conscious attention, all inherited and learned patterns of physical expressions are easy to decode because of functional precision of limbic system, parasympathetic nervous system and endocrine system. 1) Survival of Communicator 2) Evolution of Nonverbal communication 3) "The expression of emotions in man and animals" 4) "Nonverbal" is alien way of communication? 5) Basic Emotional Expressions 6) Clusters 7) Congruence 8) Proxemics 9) Context 10) Micro Expressions 11) Para Language 12) Postures 13) Facial Expressions 14) Hand Gestures 15) Fear Factor 16) What is Nonverbal Communication? 17) Gestures - Are they learned or genetic? 18) Body rubbing to soothe brain 19) Recognizing emotional expressions: Scientific viewpoints 20) Turtle Effect: Body response under threat 21) It’s Written All Over You... 22) Are you a 'flying' terrorist? 23) Why exactly languages evolved? Really informative and nicely documented article. Amygdala being part of Limbic system is the GPS of place cells and grid cells...Nobel prize finding!